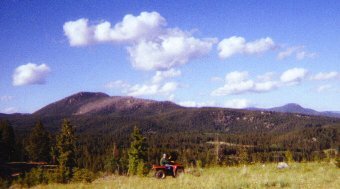 They call it "big sky country". Day 1: June 22, 2000. Montana has been pretty fun. It started out great. My layover in MN was only about 20 minutes. Then I got to fly first class from MN to MT. First row, big seats, a great meal with red wine. However, I, of course, drank pepsi. 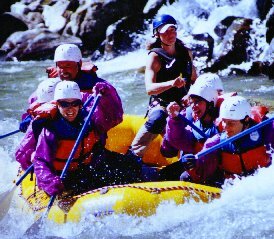 This morning, June 23, 2000, we went white water rafting. Kinda fun but cold. The water was 42 degrees. We had a female raft guide. She was buff and gorgeous. I'm in the pic below; in the front left with the shades. Then we went to Lewis and Clark caves. Not too exciting, alot of crying children. Did Cal alter this photo, or is he Spider-Man. After dinner we went riding on Honda 4-wheelers for about an hour. This was the best. Lots of dirt and dust in my mouth and eyes but it was worth it. And the views were spectacular. I was going too fast on this grassy part and hit a fence post. Almost threw me from the 4-wheeler. I was lucky I hit the post, cause the fence was barb wire. If I'd have hit the wire instead of the post, I'd have torn right through it. Then there was another time I was going way too fast and had to lock up the brakes. There was no shoulder on this gravel road and I came about 2-3 feet from going off it. 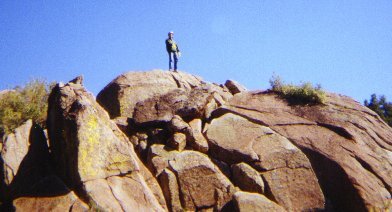 The drop was only about 12-15 feet, but it was onto boulders. Tonight we worked on my boss's computer for an hour and did not accomplish anything. So I haven't earned my trip yet. Until this trip, the farthest west I had been was Ft. Dodge, Iowa. Pretty lame I am. "You can pray to God, but keep rowing toward shore." Day 2: This morning, Saturday, June 24, 2000, some old guy "Lou" was here showing us how to shoot guns. Nothing big. Just .22 rifles and pistol. I would be a good hunter if I used a shotgun and was able to lure my prey to within 10 feet of me. Then we went to Butte and I toured Copper King Mansion, a large, brick Victorian house. Every room used a different wood. Frescos on the ceilings. Then we went to this quarry that is right next to Butte. It is one of the largest ecological disaster sites in the world. The water in the quarry is acidic. Chemicals from copper mining have polluted it. They use music and whatnot to scare away birds because birds die if they land in the water. The water area is 4,000 feet across and 900 feet deep. They don't know what to do. It would take alot of time and money to truck it or pump it away and there is nowhere to take it anyway. Who wants millions of gallons of poison. So it sits there. Everyone is afraid it will eventually leak into the ground water. They actually can still skim the slurry and get copper out of the water. There was an article about this poisonous quarry in National Geographic a couple years ago. Cal slows down for a speed bump. After lunch I almost learned what it is like to have a 4-wheeler flip over on top of me. I wasn't even going very fast. I hit this embankment and it started to flip over. I jumped/fell off and landed on my back. The back of my head hit the ground but I had on a helmet. The 4-wheeler was tipping over on to me and I was able to push it back up with both feet. I held it up with my feet and slid out and let it fall to the ground. I was actually dazed for about 5-10 seconds. I was able to tip it up and, without getting on it (standing next to it), back it out to level ground. I ended up with only a bloody scraped leg. Later I had a steak at "Bob's" and sang karoke: "You're so vain" by Carly Simon. Cal sings for his supper. Day 3: June 25, 2000. This morning I did some real computer work. Worked on my boss's accounting program and internet ISP. Went into Butte bought a new printer and installed it. In Butte we ate lunch at M&M, a cafe that's open 24 hours a day, seven days a week, since the 1870's. It originally fed miners. Fries come with gravy. The night before I was invited to a poker game that was to start Sunday, 11:00 a.m. and run all day. I asked one cowboy if he was going to church before the poker game, and he said "Hell no." Later we rode 4-wheelers again. We'd stop and I'd climb a few big rocks. We rode for a couple hours without injury this time. 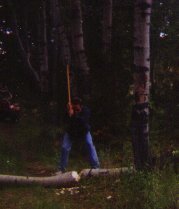 I chopped in half a tree that had fallen on the trail. I still had 2 blisters from chopping the previous day. I had a better ax this time. Then I ate steak, watched TV, and played pool with RDR. A log is in the way of a trail, not for long. 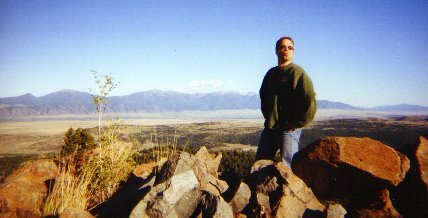 Day 4: My last day in MT, June 26, 2000, started real slow. Got outta bed at 10 a.m., did some computer work, and left for Bozeman. Ate lunch and went to airport. The landing in Minneapolis was rough enough that I took my wallet outta my bag and put it in my pocket so they would have an easier time identifing my body. Now the dilemma. I was in MN at 5:00 p.m. but my flight to CR didn't leave until 8:45 p.m. I called a cousin and friend that lived in MN but neither was home. So I figured I'll take a cab into the big city and find a good comic book shop. I thought it was a safe plan. Did I learn my lesson. The cabbie took the long way, I figured, and even missed the exit. He cut my fare but it still cost me $27.00. The comics shop was vast. I found just two comics I wanted and it was gonna cost me $12.50. But I asked him, "Do you have your silver age comics somewhere else?" Yes they did, in a special case. There were some deals, I really found some bargains, the 4th Iron Man, Spiderman #25, and filled some holes in my collection. Every comic I bought was over 30 years old, 14 comics with tax cost me $153. In a couple hours I'd spend 3 times more money than the previous 4 days combined. Ouch. Now here's the bad part. It was 7:45 p.m. I call a cab. They say I'll get picked up in 10-15 minutes. The cab gets there at 8:05 p.m. I'm a pessimist and have already accepted my fate: I'll miss my flight, I'll have to get a hotel, and ride Greyhound the next day. But I got a good cabbie and gave him a $5 tip. Got to the airport main terminal at 8:25 p.m. My gate was #20, the last one on the concourse, so I had to run a quarter mile to the gate. But I made my flight. Lesson learned: 1. Never leave home; 2. Never ride in cabs; 3. Buy your comic books on eBay. Did you look closely at all the pictures? Yes, I wore the same clothes all week.